Pines (middle) recalls, “When I hit the berm and the snow gave way beneath me, I knew I was in trouble. I landed backward, and I could see the tree over my shoulder less than 20 feet away.” Justin Pines photo. *The names of patrollers in this story have been changed to protect privacy. 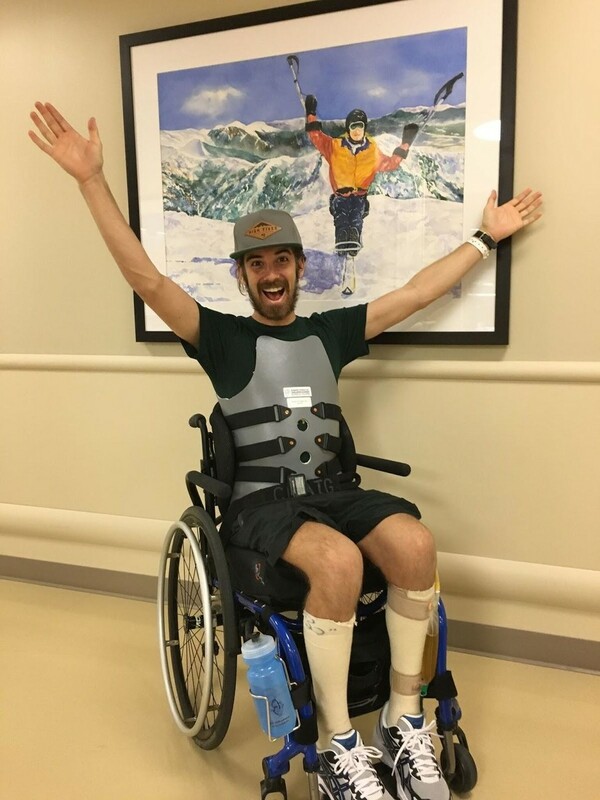 On April 9th, 2016, 30-year-old Justin Pines replied to his mother’s text, “How are you?” with a photo of him and his buddy, Michael Maag, riding Headwall chairlift at Squaw Valley, California. The conditions were whiteout and the snow was cement-like, but they were smiling, big. Minutes later, the former Division I distance runner at Princeton collided with a tree, leaving him paralyzed from the chest down. Eighteen months later, I touched base with Pines just down the road from where my ski patrol coworkers and I found him in a tree well to learn why he says the ensuing months have been the richest of his life. The radio call came in while I was hauling a bundle of bamboo to the shack at the top of Headwall chair. “There’s a report of a skier versus tree somewhere in what sounds like The Penguins. Sounds like a leg injury,” crackled Dispatch. I load the chair, the ‘boo heavy on my lap. Patrol jumps into action, and my supervisor, Bobby—the man in charge of the Headwall section of the mountain—radios he’s setting out to search. I scan the terrain from above, my vision fighting the dense fog. Pines hung upside down in a tree well, his skis somehow caught up at the top. He didn’t have a broken leg; his lung was punctured and collapsed, and he had suffered fractures of his T4/5 vertebrae, his sternum, and 6 of his ribs on the right side. Mostly, he didn’t have long before he was going to lose consciousness. While patrol searched, Pines was doing all he could to stay alive. He couldn’t feel his legs, but he wasn’t panicking. He was in survival mode; he knew he had to hold on just until a red jacket arrived and he could relinquish control. Pines spent 9 days at Renown Hospital in Reno. He underwent spinal fusion surgery that consisted of putting two rods from his T2-T7 vertebrae, with two screws in each vertebra. Justin Pines photo. Pines could hear patrollers calling out to him, but the voices faded as they moved downhill. Earlier, locating his cell phone in his breast pocket, he had let Maag know what had happened via voice recognition text, saying “I broke my back…I’m in a tree well…Get help.” Now, hanging upside down in critical condition, Pines was using it to get attention by blasting “Cut the Cake” by Average White Band. Looking back on that moment, suddenly surrounded by ‘70s funk so out of place during the sober situation, Pines remembers a flicker of a smile. There was humor, if only briefly, but it wasn’t long before it became clear the insulating snow pack of the well was completely muffling the music coming from the speaker, and that smile disappeared. What remained, besides Pines’ muffled yells, was deafening silence and the fading sound of ski patrollers calling his name. Momentum of the rescue picked up as the minutes passed, and a patroller assigned to a different part of the mountain joined the search. Simultaneously, another patroller and I clicked into our skis outside the Headwall shack. Pines needed to be found, ASAP. 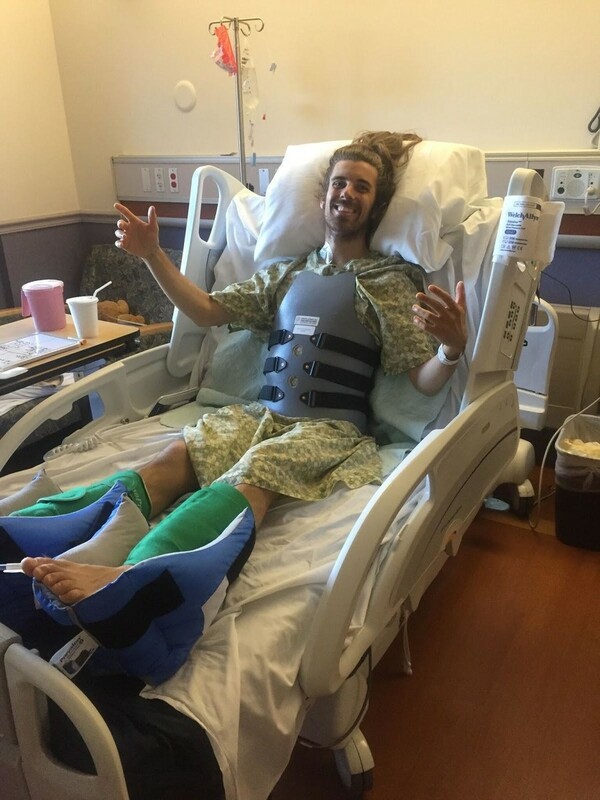 10 hours of rehab therapies and conditioning per day, and still he smiles and throws his arms up. Justin Pines photo. We headed down the ridge the same way Pines had done when the news came in over our radios: “On scene … Justin Pines … possible broken back … get the air ambulance rolling.” Seconds later, my partner was helping stabilize Pines while I hiked uphill to flag down the patrollers bringing the trauma kit, backboard and toboggan. Getting the backboard down to Pines wasn’t easy. He was deep in the well, not a place backboards just slot into easily. While some of the rescue team dug to widen the access, others prepped the oxygen, managed communications, and stood by to assist when it was time to strap down Pines and his lifeless legs. You think mountain biking’s hard on two wheels? Try three. Last summer, in Bend, OR, Pines put in 11 hours of riding over two days with Oregon Adaptive Sports. Justin Pines photo. Within minutes, we were loading Pines into the toboggan to transport him to the paramedics. I thought that was the last I’d see of him. Pines almost never checks Facebook, but he did that night, and replied: “I’m actually back this weekend!” 72 hours later, we were drinking coffee together, swapping perspectives of the day his life changed. Pines isn’t spared the wrath of climbing shoes. Justin Pines photo. 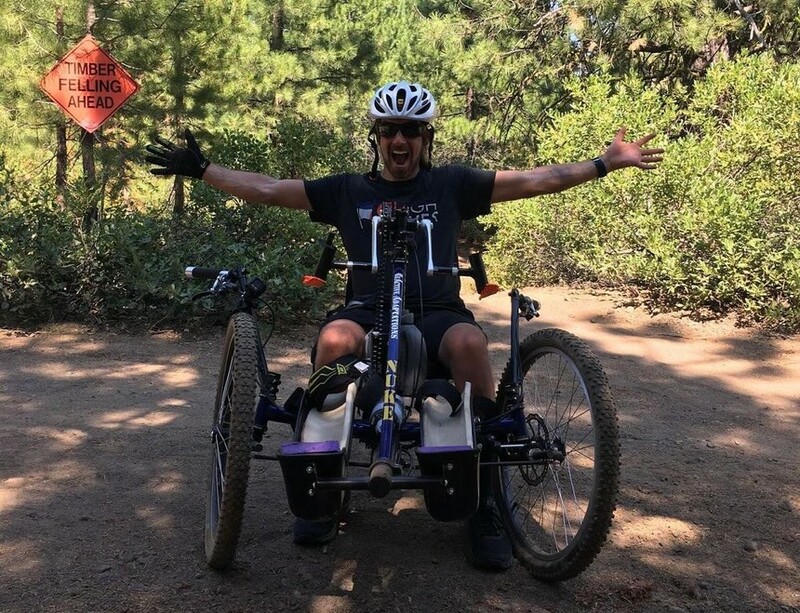 Ten weeks after his injury, and just a few weeks after his discharge from the hospital and the removal of the turtle shell brace stabilizing his torso, Pines placed his body in a hand bike and peddled in the Pedal for Possible race in the foothills of the Colorado Rockies. Pines’ friend Isaiah flew in from New York to do it with him, and when they reached the intersection where the 50K racers part from the 100Kers, Pines asked Isaiah, “Did you come out here for a run-of-the-mill day, or do you want mix it up?” Seconds later, they found themselves on the 100K course, and 9 hours later, they crossed the finish line, having battled temperatures reaching 101 degrees. “Giddy up” was their team motto, and Pines now uses it for life in general. 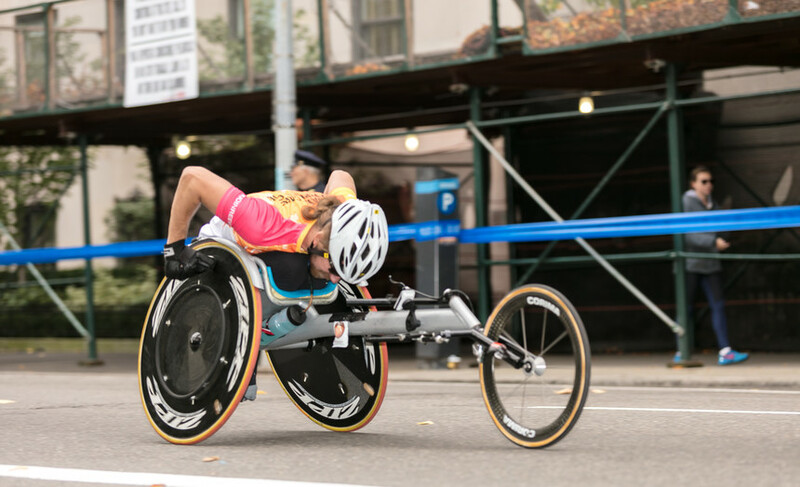 He might not be running anymore, but Pines is still racing in the New York City Marathon. Christine Dipasquale photo. That reaction is indicative of Pines’ resolve, the same resolve that had him laying in his hospital bed, meditating on the love shown to him just days after his surgery, instead of focusing on the loss of his legs. Pines says he was overcome with joy, and found himself weeping. 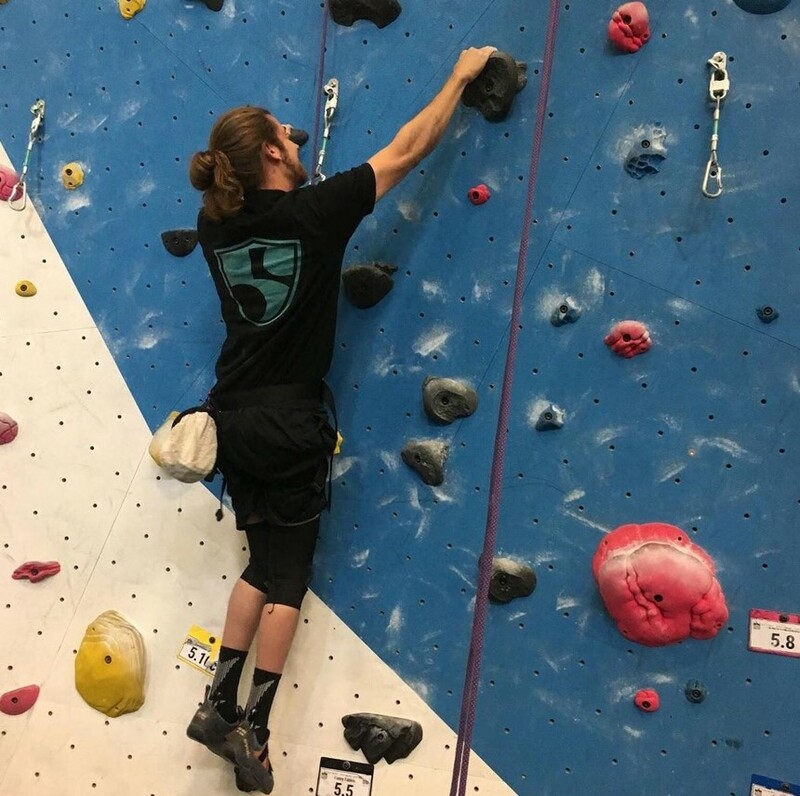 He recalls some tougher times, like when he was driving back from an outing with Craig Hospital, the Denver-based center for specialty rehabilitation and research for people with spinal cord injury and traumatic brain injury, and where Pines did his five weeks of in-patient rehab. Pines is insistent not just on the importance of accepting grief, but also in moving past it. To him, focusing on life’s potential is the ultimate coping mechanism. 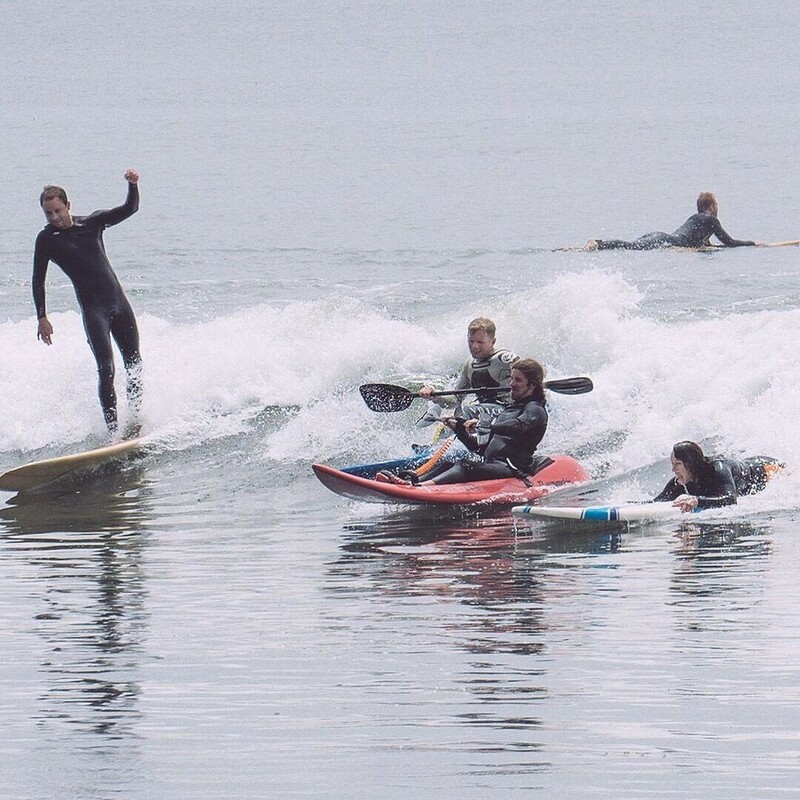 In addition to his new approach to marathons and 100K bike rides, Pines spent a week this last summer in Santa Cruz, California, with the Truckee-based High Fives Foundation getting back in the ocean and relearning how to surf. 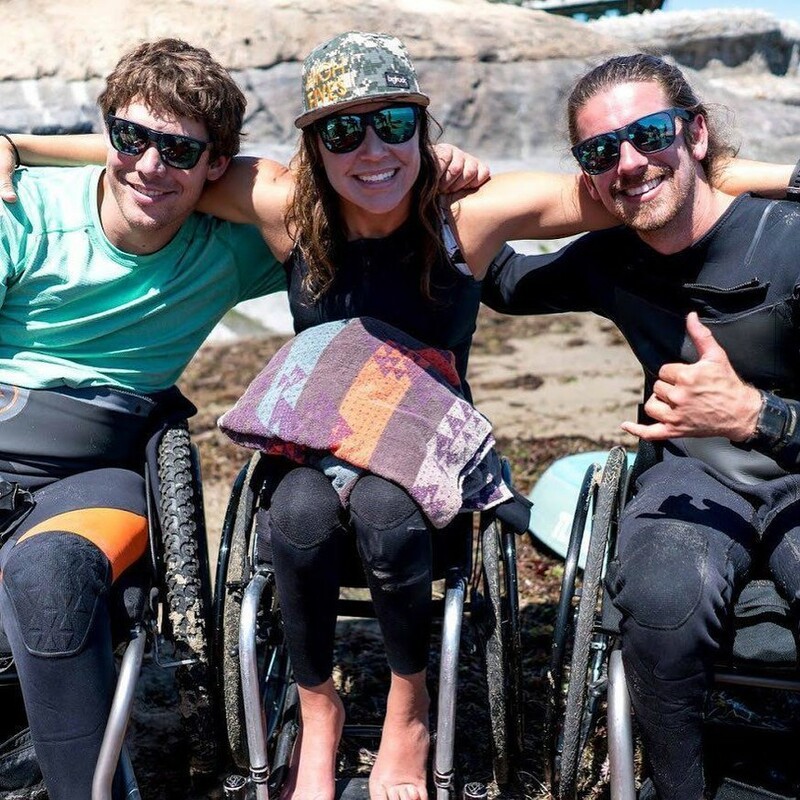 Sharing a house with 12 other adaptive athletes, Pines says he learned more than just how to surf. Pines throwing the shaka at the High Fives surf camp in Santa Cruz. Justin Pines photo. Pines says he often ends up bear-hugging–and sometimes praying–with complete strangers, and to him, that’s unbelievably satisfying. Pines has started calling this new ability to open up to strangers “the superpower of connection,” and says his injury has helped him establish more trust by way of being vulnerable. Accordingly, he’s reclaiming so many aspects of what life was, and more. If I were to describe Pines in two words, it’s these: fired up. 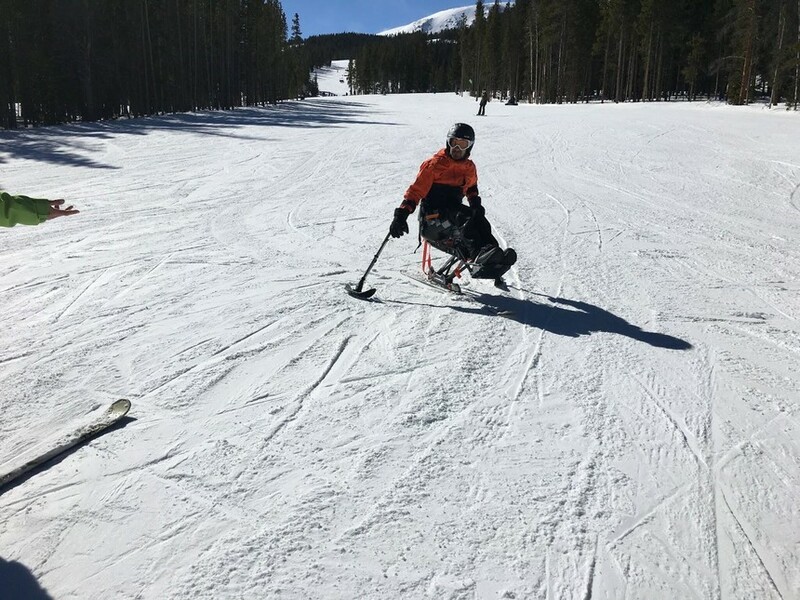 Last March, just one year after the accident, Pines returned to Squaw, in a sit-ski. I ask if he made it back to the crash site, and he chuckles, “I need a few more years of practice before I can get there, but I told my buddy to go pee on it for me.” He’ll do the same one day, he says. “If I can catch a wave, get pummeled, get back onto the board and paddle out for more...what can't be done?” Justin Pines. Hitting the tree took away the use of Pines’s legs, but it didn’t take anything from his spirit. Ultimately, Pines says he finds freedom in his conviction that his life was never meant to be just about himself. For now, he crushes greens, but one day Pines will make it back to the site of his accident. When he does, he says he’s going to pee on the tree. Justin Pines photo. Before we take the last sips of our coffees and part ways, I ask Pines how Maag’s doing. Pines says, plainly, that Maag wants to be a volunteer patroller. 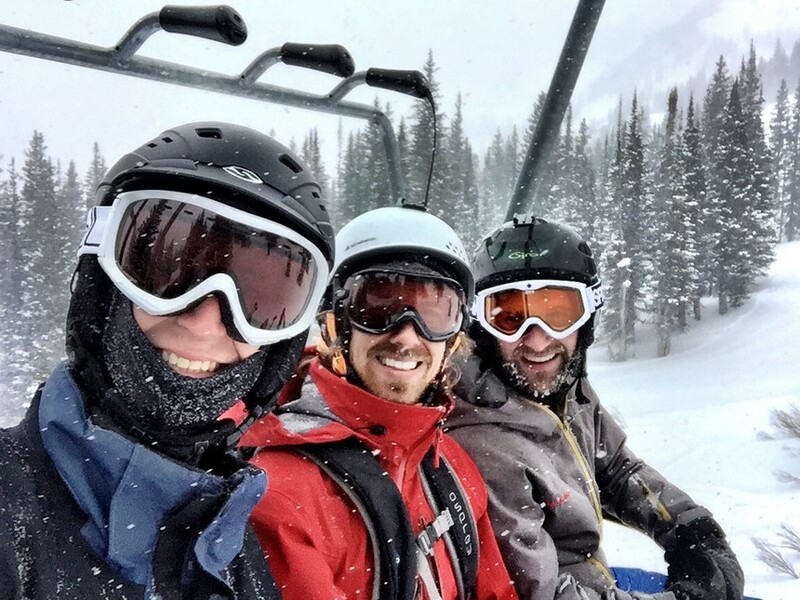 Squaw ski patrol saved his buddy’s life, and he wants to pay it forward. Damn man you are lucky. Anyway nice article loved it. Nice Article, Truely travelling is Fun. I always would like to travel at night. Cold wind, snow, moon which are all my most favorite things. when i was in switerland which i would say switherland is the most happiest place human to live there and also i have lot more place to travel in my dream list. I also love play <a href=“https://www.friv2kizi2.com”>friv<a> games like football, ice fishing like that.